Many entrepreneurs open restaurants because they want to share their love of food with the public and make a little money along the way. 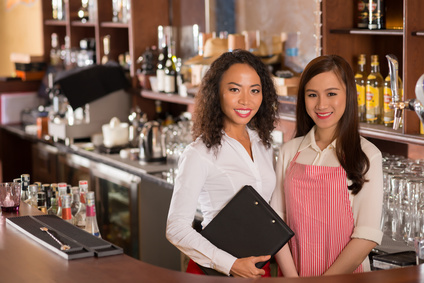 Restaurants are often a labor of love, but they can quickly turn into a human resources nightmare if you aren’t careful. Let’s look at five top restaurant HR challenges and how you can manage them to stay within the letter of the law, lower your liability, and keep your employees happy and loyal. It’s so hard to find good people. Nowhere is that more true than in the restaurant business. According to the National Restaurant Association, the industry’s turnover rate in 2016 reached over 70% for the second year in a row. Losing employees is expensive and frustrating. Each loss throws your scheduling off balance and forces your HR team to scramble to find a replacement. It takes time and effort to train a new recruit, and your customer service may suffer in the short term. How to Deal – Keeping good employees isn’t rocket science, but it can be difficult in an industry that runs on tight margins. If you can, pay competitive wages, offer benefits to management, and provide predictive scheduling for your workers (even if it is not required by law in your area). Focus on developing a strong onboarding process to train new employees more quickly and thoroughly so they have a better chance to succeed. A typical restaurant is filled with knives chopping, stews bubbling, and servers carrying trays loaded with delicate glassware. The risk of cuts, burns, slips, puddles, and broken glass (just to name a few) are simply standard operating procedure. So is the ever-present threat of a food-borne illness affecting customers. Even a single slip could lead to a lawsuit from an injured customer or employee. With so many opportunities for things to go wrong, how can you keep your staff and customers safe? How to Deal – Risk is inherent in the restaurant business. You can’t avoid it, but you can help actively manage it. That starts by developing a safety manual for all employees and staff. It’s not enough to just write the manual. Ensure that your management team actively enforces it. Make sure that all spills are cleaned up immediately, that all employees are required to wash their hands after using the restroom, and that you provide safety equipment, such as no-slip mats on the kitchen floor and cut-proof gloves. Additionally, invest in the right types of insurance so that you can survive a legal or PR crisis if it should occur. Oy! Your managers are on a salary. Your servers earn tips on top of their hourly wage. Your dishwashers regularly work overtime. Payroll at a restaurant is complicated, especially when you layer on the multitude of federal, state, and local wage rules. If you aren’t paying your workers the local minimum wage, or if you run afoul of the Fair Labor Standards Act, you could face expensive fines and an employee revolt. How to Deal – First, make sure you absolutely know what the minimum wage is for all of your restaurants. This can vary greatly from state to state and even within municipalities within the same state. (Example – California just overhauled its minimum wage rules at the beginning of 2017). You also need to make sure you understand how employees earning tips should be handled. Recently, the U.S. Department of Labor mandated that restaurants cannot require its servers and wait staff to share tips with back-of-house staff. Though this decision has been challenged and is now pending before the Supreme Court, it is still actively enforced! Finally, it is imperative that you understand the overtime rules for each of your restaurant locations. Track work schedules closely and don’t allow your managers to cut corners just to fill up the schedules. If you overlook overtime abuse, you could be hit with a massive employee lawsuit and a hefty fine from the government. Restaurants often rely on a large amount of foreign-borne workers. In such a competitive industry with a high turnover rate, it can be easy to overlook I-9 requirements. Don’t take this risk! It is not good PR to have ICE kick down your door and lead away half of your employees. Additionally, if the government finds out that you weren’t dotting your i’s and crossing your t’s, you could face huge penalties and possible prosecution. How to Deal – This one is simple. Make sure you ask for and receive the right identification documents from every single employee and fill out Form I-9 when necessary before bringing them on. You are required to keep Form I-9 for three years after the hire or up to one year after the employee is terminated. Yes, this takes more time, and it may eliminate candidates when you desperately need to fill positions. However, following the law is always the smart move in the long term. The issue of discrimination continues to evolve in the United States as we recognize the challenges of different minorities in our community. Business owners must be sensitive to both overt and subtle discrimination against African Americans, women, members of the LGBTQ community, senior citizens, and others. This means creating a safe and accepting workplace as well as addressing wage gaps and promoting equal access to job opportunities and advancement. The rules surrounding discrimination are becoming more complex and more severe for businesses of all types. The federal government passed the Lilly Ledbetter Fair Pay Act in 2009, which makes it easier for employees to file a complaint of wage discrimination against their employer. Recently, several states, including California and New York, have updated their gender pay equality laws. Finally, the Equal Employment Opportunity is likely to soon require large employers to submit information on employee compensation. How to Deal – First, make sure you clearly understand all of the relevant laws regarding discrimination in your state and municipality. Next, write up a clear anti-discrimination policy and include it in your employee handbook. Again, talking the talk is not enough. Provide appropriate training to your management team, take all accusations of discrimination seriously, and consider providing employees with a means of submitting concerns and complaints in a safe way. It may also be a good idea to perform an audit of your restaurants. Look at the racial and gender makeup of your staff. Analyze who is being hired, who is being promoted, and wage equality. If you notice any concerns, address them immediately. It can feel overwhelming to try and manage all of these different risks while still trying to keep your restaurant afloat. You have food to make, ingredients to order, and staff to manage. How are you going to find time to write an employee manual, develop an onboarding process, audit your restaurant hiring policies, and teach yourself the local wage laws? You don’t have to do it alone! If you’d rather focus on running a great restaurant, then outsource your HR headaches to a company that specializes in HR, like Arch Resources Group. We can help you handle your biggest HR risks to lower your liability and let you do what you do best – sharing great dishes with your happy customers!